As most of you maybe aware, my brother Kirk (49) has recently been diagnosed with bladder cancer that may also possibly be in his kidneys and prostate as well. He owns his own business setting up and running video productions for big conferences around the world. Now that he is getting ready to start treatment for his cancer he will not be able to work since his work requires travel and he will need to be home for all of his treatments. Since he will be unable to work he will have no income during this time and is very stressed right now about how he will be able to provide for his wife and 2 kids. Many people have asked what they can do? I'm setting this page up to raise money for him to get through financially during this very difficult time and to help pay for medical bills. If you can't contribute financially we understand and do appreciate all of your prayers! Kirk lost his battle with cancer on January 23, 2019. He fought 3 1/2 years, but this cancer grew very quickly and took over his left lung. We are very Thankful for ALL of support through these years. The kids and Carol have to learn how to live life again. Please keep them in your thoughts and prayers. Update on Kirks CT scan results. Here it's in his own words. An update on my health - today Carol Garreans and I met with my oncologist, who gave us the results of my latest CT scan. It appears that the chemo is working, and at least some of the tumors are shrinking! Some in my lung area have been reduced by nearly half, others are a bit smaller than before I started chemo, and some don't seem to have much change. But the doctor says that I am responding very well to the chemo, and he is going to change me to a different chemo drug that is more powerful, as long as my kidney function remains normal. I still have at least 3 more rounds of chemo, which is a total of 9 more weeks, and then I will get another CT scan and we will discuss my options from there. Surgery is still off the table at this point, but might be an option if the chemo is completely effective in eliminating all signs of cancer in other parts of my body. Please continue to keep us in your prayers, and we appreciate the love and support we continue to receive from all of you! Here's a quick update followed by an awesome writing from Kirk.......It's definately a must read! Kirk went in for a CT scan today and will get the results on Wednesday. This will be able to show if the chemo is working or not on his cancer. Please pray for a miracle! It would be awesome to find out some good news!! Kirk and Carol celebrated their 29th wedding anniversary yesterday and Kirk posted this writing to his FB page . I love it so much that I had to post it here too! Today , January 10, 2016, is our wedding anniversary. 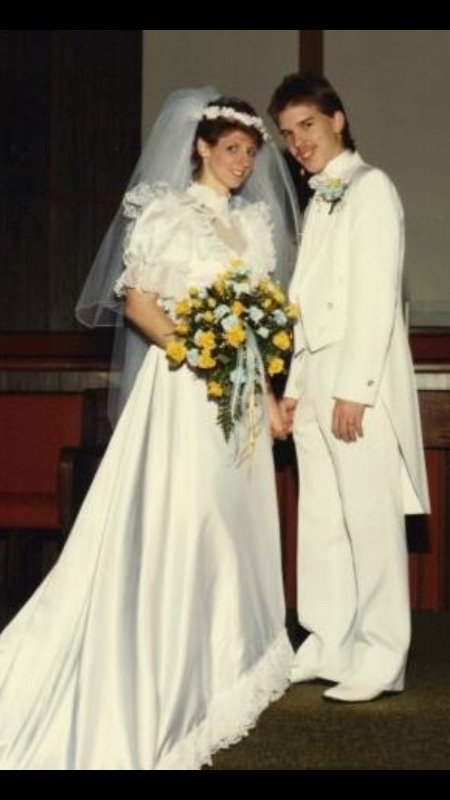 I’d like to say that it’s been 29 years of wedded bliss, but of course anyone that has been married to the same person for more than a few years knows that there is no such thing as wedded bliss. In fact, it’s been much more like riding a never-ending roller coaster. 29 years ago, Carol Garreans and I were standing in line, waiting to board the ride. Excited, because it’s something we both decided to ride together. But also nervous - did I ask the right person to ride with me? What if she doesn’t LIKE roller coasters? Will he stay on the ride with me forever? But together, we approached the boarding gate, made our vows, and got into the car. Unlike in the theme parks, we had the car to ourselves, and of course we were in the front row. There was extra room in the car, but we had no plans to fill the other seats at that time. Then the ride began... up the first hill, not slowly, but like one of those mag-lev super fast coasters that fires you instantly to full speed up the first hill. Woohoo! What a thrill! What a ride! Most of our fears are lost in the absolute joy of holding hands while going up and down the dips and through the curves, loops, and twists. Hands up - we’re doing this! But sometimes, we see that the smooth steel track turns into a wooden coaster. Instead of easy, comfortable curves, we start to feel each and every bump; each hill makes us wonder if maybe the car will fall off the track. The hills become steeper and harder to get to the top. We’re still holding hands, but sometimes we take our hands off each other to just hold on to the railings of the car, to support ourselves. It’s still fun, but perhaps this ride isn’t going to be the thrill we once thought it was. However, each January 10th, we would sail through the station, tired, a bit sore, but each of us with our arms in the air yelling “AGAIN”! So up and down we would go again - the ride sometimes smooth and fun, and at other times bumpy, tiring, and making us wonder why we had ever decided to get on in the first place. The curves often pushing us closer together, and yet just as often pushing us away from each other in the car. Many times we both want to yell George Jetson’s famous line “GET ME OFF THIS CRAZY THING!!”. Yet we endure, sometimes because we want to, but always because we have to - we swore an oath to each other and to God that only death could separate us. Then more changes to the ride - after 18 years of riding this thing alone, we suddenly had another passenger in the car. Abby is tiny, fragile, and can’t even hold her head up, yet here she is, riding the rails with us. We choose to protect her at all costs, even if it means we have to absorb even more bumps, rattles, pain, and terror; as long as she is protected, it’s worth all the extra effort. Soon, another little one joins Abby, and with Matthew, our coaster car is now officially full. We continue the ride with even more at stake, and the hills seems to get even bigger, higher, harder to get up and with much steeper drops when we head down the other side. There is illness - Carol spends 2 weeks in the hospital and months on IV nutrition before she can eat again. Up a steep hill, and down the other side. The kids are, thankfully, healthy, but they still add a lot of additional turbulence - around curves, and even more upside-down loops. Bankruptcy - a HUGE hill that lasts for a decade, and one that we are still climbing, trying to get over so that we can hopefully once again enjoy the coaster. And we continue to ride; continue to yell “AGAIN” and the ride brings us closer than ever to each other. Recently, the ride has taken a terrifying change for the worse. Cancer. The hills are seemingly insurmountable, the curves painful, the dips inducing not thrills but nausea, and for the first time, we wonder if the track is going to continue going forward or if we will round a curve and find that there is no more track, and the car will hurtle off into space. The unknown is no longer exciting, but just horrific. Words like chemo, Stage IV, and surgery are replacing the sounds of the track beneath us. Unemployment, with no disability insurance, and no idea of when we will have income again. The loops are not fun anymore. What was once a fun zero-G hill now makes us feel like we will be thrown from the car. Yet our faith in God, and our wonderful friends are helping us stay on this ride - keeping us alive, keeping up our spirits, and helping us to pay some of the bills. The ride continues, and doesn’t get any easier, but it is more bearable because we know we are not alone, and that so many people are praying for us and cheering us on as we hold each other tighter, and continue to ride the ride we chose to take together 29 years ago. I don’t know if we’ll have another chance next year to do it, but for now, today, we are raising our hands higher than ever before, waving them wildly and shouting “AGAIN!! AGAIN!!!”. 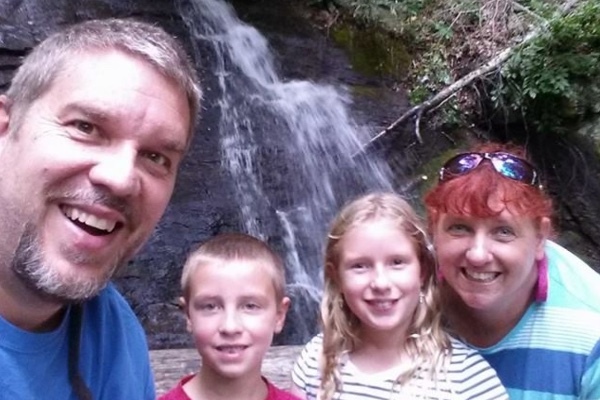 If you would like to help us as we fight this battle against cancer, please visit our GoFundMe page at https://www.gofundme.com/jg6fpns4 and please continue to keep us in your prayers. Here's a little update from Kirk......Just a reminder of our funding page - with the new year come a lot of new expenses, especially with regards to healthcare. We have our deductibles to meet before insurance kicks in, then lots of co-pays, and as last year, we will quickly hit our max out of pocket expenses, then they should start covering everything else (we hope). And of course we still have a mortgage, insurances, utilities, groceries, and kids to house, feed, clothe, and entertain. Thank you all who have given, and please consider giving something if you can. And please feel free to share! Thank you! Praying for your husband. My husband who has small cell lung cancer. Found it originally by a tumor that went to his brain. He started out with the surgery, then did chemo, then did radiation to his lungs and now gets immunotherapy which I have great faith in as it saved my son 2 years ago from stage 4 melanoma. Because my husband had the brain tumor removed he has to be on seizure meds and they have given him a lot of problems. He is coming off one now and will finish coming off that and start the new one. Did you get your husband on Social security disability? You don’t get paid till after being out of work for 5 months actually start getting it in the 6th month. If you haven’t done this you can do it on line. Don’t have money to help but I can give advice. My husband sees Dr Adams. He is a fantastic doctor. Really love this guy!! Best wishes to you. Rest in peace Kirk and may God provide your family the necessary strength and guidance to carry on.